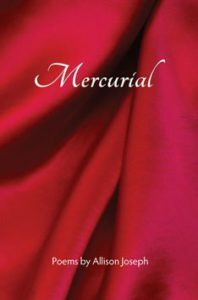 Mercurial is the latest collection of poems from Allison Joseph: always accessible, musical, full of hard-earned wisdom, sass, and courage. Joseph writes about everyday situations in deft, heartfelt poems that span the spectrum of poetic ambition–free verse narrative, short lyrics, traditional rhyming forms and topical meditations. She is a poet of song and strut, an ambassador for the written word’s deviations and variations, a conversationalist who just happens to speak in rhyme and meter. Readers of this book will encounter a woman who’s not afraid to be herself—even if that self is ever-changing, ever-evolving. Allison Joseph lives, writes, and teaches in Carbondale, Illinois, where she is part of the creative writing faculty at Southern Illinois University. She serves as editor and poetry editor of Crab Orchard Review, moderator of the Creative Writers Opportunities List, and director of the Young Writers Workshop, a summer writers workshop for teen writers. Her books and chapbooks include What Keeps Us Here (Ampersand Press), Soul Train (Carnegie Mellon University Press), In Every Seam (University of Pittsburgh), Wordly Pleasures (Word Tech), Imitation of Life (Carnegie Mellon UP), Voice: Poems (Mayapple Press), My Father’s Kites (Steel Toe Books), Trace Particles (Backbone Press), Little Epiphanies (Imaginary Friend Press), Multitudes (Word Tech Communications), The Purpose of Hands ( Glass Lyre Press), and Mortal Rewards (White Violet Press) . She is the literary partner and wife of Jon Tribble.